For Jake Liefer the most unexpected perk of the papal visit weekend happened not on the Parkway or at Independence Hall, but in the serene streets of the city, where he got to take his 1-year-old daughter with him on their first bicycle ride together. "I felt safe riding on these open streets with pedestrians and other bike riders and without having to worry about cars," the Point Breeze resident said. "It was so joyful without cars honking, engines revving." There was also the yogi striking warrior poses on the middle of Race Street; the three friends lying on their stomachs at Broad and Locust smiling for a picture; and all the parents, who, like Liefer, took their children out to play in city streets typically too congested for such activities. Liefer, a 30-year-old IT security consultant, came out of the weekend wondering why it had to end. So he launched a campaign called "Open Streets PHL" to urge the city to set aside three carless weekends next summer and bring back that eerie but liberating feeling. 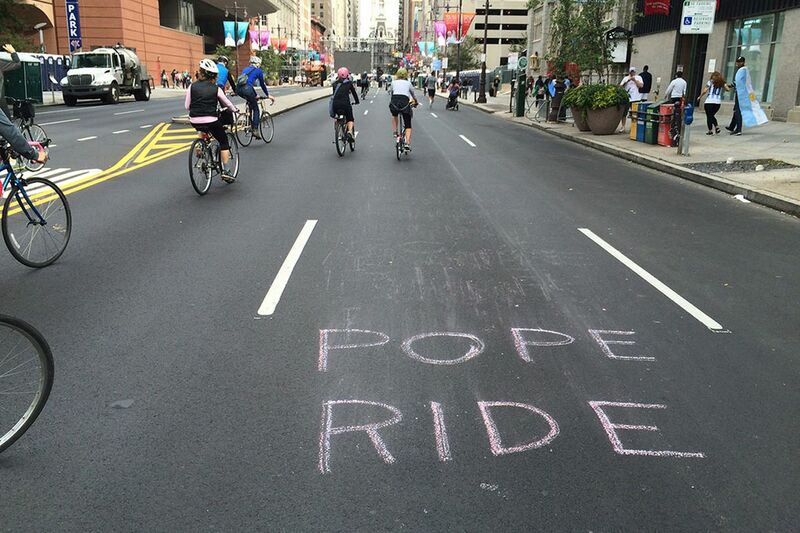 The idea took off on social media; a #popenstreets hashtag was born. Online petitions swelled with names. Support came from the city's bicycle community - including those who rode on PopeRide, a bike tour through town during the visit. National media picked up the cry, with Slate magazine calling Philly's car-free weekend a secondary religious experience. Mayor Nutter leaped on board, saying he was prepared to set up days with no-vehicle zones before his term ends in January. "The administration will be reaching out to all potentially impacted stakeholders, including residents, businesses, and transit agencies, for their ideas and to have a forum for discussions to develop various proposals," his spokesman, Mark McDonald, said. Democratic mayoral nominee Jim Kenney and Republican Melissa Murray Bailey liked it, too. It's "something I've thought about for the last several years," Kenney said in a statement. "Bogota [Colombia] has a great model . . . but I also want to get feedback from everyone affected by this weekend's open-streets experiment." Bailey said she would listen to "any ideas that make the city more pedestrian-friendly." Not everyone is gaga over the idea. When the city announced street closures for the papal visit, businesses had to hustle to find ways of bringing in deliveries and employees, and taxpayers wondered who was footing the overtime bill. Joseph Martin, who teaches civil engineering at Drexel University, is skeptical of Liefer's idea, which he says seems to lack a point. "I don't think people have said what they want to do with the space. Is this just for the hell of it? So people can wander?" he said. "Someone is using that road to go from somewhere to somewhere. So how do the needs of advocates that want to play dog Frisbee in front of their house exceed the people in their cars and their needs? That's pretty arrogant." Martin said he realizes road closures are necessary for festivals. But closing streets just to close them? Not so fast. "The papal visit, a block party - everyone understands that," he said. "But to simply do this arbitrarily as a way of saying 'Fairmount Park isn't enough,' . . . it's not a village in the Austrian Alps. Center City is the hub for economics, for culture, for education." And what of elderly residents who depend on cars for tasks as critical as groceries or a doctor appointment? "If you can't drive your car up to a store, you can't drop off an elderly relative," Martin said. "The other thing is, traffic would be rerouted to another neighborhood in Philadelphia, so the next one-way street's going to see their traffic doubled or tripled." Even so, the Open Streets Philly Facebook page had more than 4,000 supporters within 36 hours of Liefer's creating it. A Change.org petition drew 2,500 signatures in 24 hours, and the executive director of the Center City Residents Association, Stephen N. Huntington, rallied his members to the cause with an email quoting Bogota's former mayor, Enrique Penalosa: "An advanced city is not one where even the poor use cars, but rather one where even the rich use public transport." Bogota went carless years ago for "Ciclovia," in which some streets close Sundays and holidays from 7 a.m. until 2 p.m. Ciclovia has spread to 14 nations and 31 U.S. cities. Los Angeles launched its version, CicLAvia, in 2010 and now does it at least twice yearly. On three Saturdays in August, nearly seven miles of New York City streets are opened to the public to play, run, walk, and bike. Courtney Whitelock, project manager for Summer Streets, now in its eighth year, said there has been no major pushback for the event; the cost is mostly covered by corporate sponsors, and the event brings in as many as 300,000 people per year. Of course, Philadelphia closes streets for festivals, and Martin Luther King Drive on the weekends from April to October for cyclists and runners. Liefer wants something bigger, though - closer to what people experienced during the papal visit, when 4.7 square miles were closed to traffic. Liefer said the goal would be to benefit local businesses, many of which say they lost revenue because of tough security measures during the pontiff's stay. "We're looking to strategically do this in a way that significantly benefits everyone and doesn't have any ill effects," Liefer said. "I mean, what's going on at 9 a.m. on a Saturday at 20th and Market?" Toss in neighborhoods and their mom-and-pop businesses, said Andrew Stober, a independent candidate for City Council and a former chief of staff in the city's Office of Transportation and Utilities. "It's a missed opportunity if we make this just about Center City," he said. Stober suggested a route along West Philadelphia commercial corridors - down 52d Street to Baltimore Avenue, then through Powelton Village to the zoo. He warned that that would not be easy. "It's a big endeavor to take on, and it can be quite expensive," Stober said. "You need to have, in addition to the appropriate police coverage for closing the streets, you also need lots of other city personnel to direct traffic and keep cyclists away from pedestrians." Resistance could also come from city drivers and commuters. To Drexel's Martin, a self-described city boy who drives to work from his home in Havertown, a no-car day also takes the soul out of what makes an urban metropolis just that. "The hustle and bustle of the city," he said, "it's part of the excitement." U.S. Rep. Chaka Fattah (D., Pa.) remembers how he once suggested Philadelphia study imposing "congestion taxes" on cars driving into Center City, similar to a system London has - and was swiftly shouted down. A few days without cars on the streets, though, could be a much easier sell, Fattah said last week. "People loved it this weekend," said Fattah, whose district includes part of western Center City. "I've heard from constituents, and I think it's something we could do."